Atmark Designs mobile development team can assist with integrating and developing mobile compatible websites, mobile apps, mobile game apps, and much more. Mobile technologies have evolved rapidly over the past few years. From two-way pagers to being a mobile phone with GPS, web browsing, instant messaging, and gaming. One can quickly see how important mobile technologies have become in our everyday lives - and more so, a technology that cannot be ignored in business. Have you tested to see if your site is mobile friendly? Mobile web usage has increased drastically over the past few years and you cannot afford to ignore it. If your site isn't easily viewed on your mobile device, creating a mobile compatible site will allow your target audience to be able to access your site easily and efficiently from their mobile phone. Don't be left behind - make sure that your website can be viewed on mobile platforms. 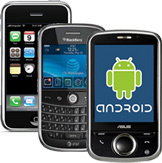 The possibilities are endless and our mobile app developers can create high quality applications to meet any purpose.